It’s no trick…it’s true! You’ve been asking for it and now you’re gonna get it! Monster Scenes is thrilled to announce a new partnership with Trick or Treat Studios to bring to you a first-of-its-kind deluxe mask — DR. DEADLY! 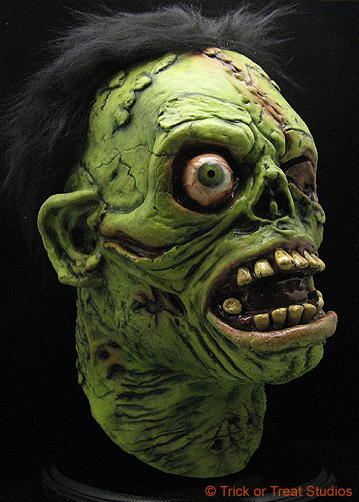 Get ready to don an incredible new mask inspired by the unsettling art from our own Jim Craig. Soon, you can carry out your own devious deeds thanks to the freshest name in fear, Trick or Treat Studios. 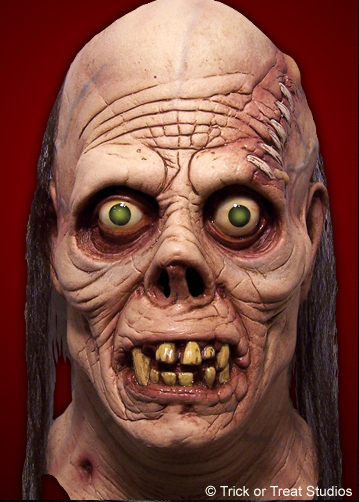 These folks truly have the fright stuff when it comes to designing and delivering high-quality masks of all shapes and styles, each guaranteed to send chills down your spine and shake you to your core. The new Dr. Deadly deluxe full head mask is being sculpted by the insanely talented Justin Mabry (of Nightowl Productions fame), the man responsible for the Shock Monster, Ghastly Ghoul, and other terrifyingly twisted visions. Justin, it seems, has something of a personal vendetta to settle with Dr. 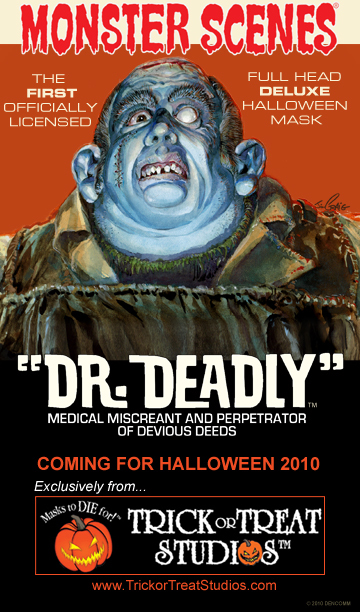 Deadly, and promises to dish out a dose of his own perverse prescription for your favorite medical miscreant. Visit the Trick or Treat Studios now to see the mayhem they’re already serving up. Then, watch for the new Dr. Deadly mask to premiere October 1, 2010. Quite a Halloween treat, wouldn’t you say? In case you haven’t visited it yet, you must go to the “From the Vault with Andy Yanchus” section of MonsterScenes.net. There, original Aurora project manager and product designer/developer Andy Yanchus has unearthed some truly rare finds and facts about Monster Scenes. And, if you’d like to see more rare details, images, and artifacts revealed in the Monster Scenes “Vault,” drop us a line at info@monsterscenes.net to let us know. Amazing! 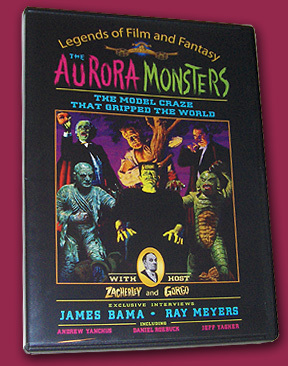 Cortlandt Hull just “pinged” us to say that, since the journal entry of June 2nd, only 7 sets of the limited “Aurora Monsters” DVD, limited MS kit, and poster remain. You folks snapped up half the sets available in less than two days. Remember, if you want to add one of these collector’s sets to your collection, email witchsdungeon@sbcglobal.net now! Following the May 16, 2010 premiere at Wonderfest, feedback has been flowing in to Cortlandt and co-director Dennis Vincent that the documentary “nailed it.” It’s a fun and informative look back at the Aurora monster kits of the 1960s and includes plenty of rare information about the follow-on Monster Scenes kits of 1971. Plus, TVs favorite “cool ghoul” Zacherly is on hand to oversee the proceedings, assisted by irrepressible sidekick Gorgo, trained by Bill Diamond. Only 100 of the Wonderfest-exclusive single-disc Premiere Edition DVDs were pressed, each accompanied by the limited Monster Scenes Transparent Green Frankenstein kit and the Wonderfest commemorative poster (both also limited to 100 units produced). “When these last few sets are gone, they’re gone for good,” says Hull. You can get a set for yourself but you’ll need to act quick. Send an email to the Witch’s Dungeon at witchsdungeon@sbcglobal.net for information on how to order – do it now or regret it later. Our thanks to Hull and Vincent for helping us send the alert to Aurora and Monster Scenes followers. You are currently browsing the Monster Scenes Official Blog blog archives for June, 2010.